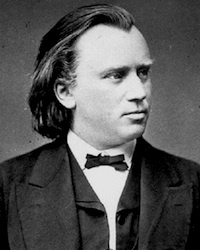 "Brahms was very deeply in love with Schumann’s wife, Clara. I think they loved each other very much. We don’t know – we suspect it was probably platonic. And he was much younger than she… Nevertheless it is a beautiful portrait of Clara, and I was thinking of in the cadenza, there’s a reference to a German popular song, which goes like this; you might know it… [Ohlsson demonstrates.] Those last words are “you don’t know how good I am for you.” … It’s a tender moment and it shows you how thick with extra-musical references these things can be, but they are not essential to know to appreciate the beauty of the music, because it stands also on its spiritual content and its beauty stands fully by itself. Yet you are only enriched when you know that there are possible extra references." Put the ethereality away for a moment. That is potentially the most human line ever uttered. But Brahms and Clara’s tangle of feelings, still confusing after a century and a half, wasn’t the only love onstage, because Minnesota Orchestra conductor laureate Stanislaw Skrowaczewski was in the house. He is more beloved now than ever. In Minnesota, the seven syllables collapse down into one: Stan. Stan feels unreal to me. I feel like he took a time machine into to our twitchy age of smartphones and social media from a statelier era of cigarette smoke and bomb shelters. This is a man who studied with Nadia Boulanger. There are pictures of him standing with Shostakovich. Fifty-five years ago he was appointed music director of the Minnesota Orchestra back before it was the Minnesota Orchestra. (The name change from the Minneapolis Symphony only occurred in 1968.) It was Skrowaczewski who conducted the musicians’ first independent concert of the lockout. He was also the one to conduct their first concert back at the remodeled Orchestra Hall after a new musicians’ contract was signed in early 2014. And in a quirk of the calendar, he was also the first man to take the podium after the Minnesota Orchestra’s historic trip to Cuba, which was the event that proved to the world in a truly spectacular fashion that the lockout era is, indeed, over. During the broadcast, MPR announcer Brian Newhouse observed a score of Beethoven 7 on the podium. Stan never touched it. He has loved this music and this orchestra for so long that he doesn’t need a physical reminder. It’s all in his heart. Before the concert started, I talked with a few musicians who were roaming the lobby, discussing their historic Cuba trip. The Orchestra Hall lobby is now the musicians’ reception room, where they come to meet and greet their loving public. There was a dazed excitement on all their faces, like every traveler had just awoken from a communal dream. “How can you even begin to describe it?” one of my readers asked. She had once been among the management’s loudest critics, but things have changed so drastically within the organization that she paid to travel to Cuba with board leadership, visiting with and indeed befriending former adversaries. “Where do you even start?” she asked. I don’t know; I wasn’t there. All I know is that clearly something special happened – something special that has not been fully absorbed yet – and it’s going to help power the organization for a long time to come. I then heard a story from Orchestra musician Marni Hougham about how a Cuban wind player, who had so faithfully pursued her studies even in the face of grinding poverty, broke down in tears when the Minnesota musicians gave her a reed case. She’d never had one before. I can’t even begin to count the kinds of love in that single interaction. And as if this wasn’t all thrilling enough, before the performance began, representatives from both the musicians and management came onstage to announce The Big News. (You know things are going well for an orchestra when a Cuba tour is the secondary good news story of the week.) Without any lawyers present, the two parties had come to agreement on a new contract that includes modest pay raises and extends until 2020…nearly two years ahead of schedule. And not only that, but Osmo Vanskä is sticking around until at least 2019. Massive gifts have been flowing into the orchestra’s coffers. Recordings and tours loom on the horizon like a sun about to rise. This orchestra is back in business and stronger than ever. Will there be challenges? Heck, yeah. Life is nothing but an endless cycle of challenges. If the challenges have ceased, that means you’re dead. But will we have the ability to face the uncertain future with strength and wisdom? There’s no doubt in my mind: yes. I’m lucky to have many forms of love in my life. Some are pure and unshakable, like my love for music. Some share the intensity of intention, but are far more baffling to understand or come to terms with or describe…or even admit. 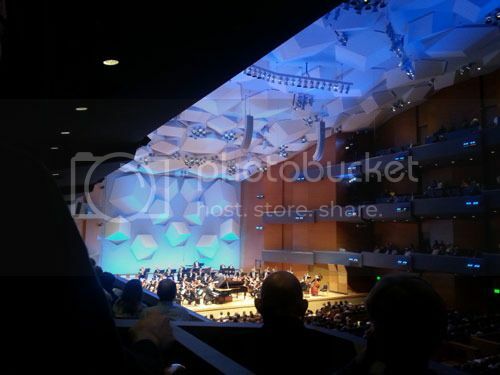 The first and last time I heard Beethoven 7 live was Minnesota under Osmo. July 2010, the weekend before my twenty-first birthday. Back then I wrote an essay that was roughly five percent review and ninety-five percent shameless fangirling. I felt the same love for this more recent Beethoven 7, only with an even greater intensity. If that’s possible. "I’ll try to remember little bits and pieces to give a vague idea of what it was like, but honestly I was rendered rather speechless. There was power suffused with delicacy – extraordinary dynamic range – palpable commitment on the part of everyone onstage, from the strings to the brass to the woodwinds to Maestro Vanskä – elegance – earthiness – charm – passion. Passion above all else. These musicians were so excited to share their love of the music with us, and the electricity in the hall proved that the audience was just as excited to hear it as the orchestra was to play it. It was such a special feeling to communicate with these extraordinary virtuosos in that intensely personal way. I wish I could tell you more than that – give you more details about what exactly I loved – but I really can’t. I was too carried away by the joy and power of the sound. There is nothing to say except this is the pinnacle of our art. This is why I love music. This is one of the greatest experiences a human being can have." This essay was re-posted from my blog, Song of the Lark.